A flying saucer floated down. Is Scarf-chan, sleeping peacefully, taking a nap. Waking her up in a place whose name she couldn’t tell. She even wonders how and where she really came. Moving so gracefully, waving their tails. Passing fish, coral reefs, and urchins and things. Jumping up from the water and up to the sky. Easily passing them and taking the lead. Frightening and eating the smallest ones in the bay. She flicked the shark’s nose and it flew up through the air. With the strength to send a giant shark back to the coast. And she promised she would always use her powers to help. And learn about all the new things she could do! And grow her powers more and more each day. With denim shorts, a pair of gloves, and the scarf she had been wearing since birth. As she tries to figure out, how her memories could be retrieved. And most of the time she plays with them. About this new place and go explore. In only a few hours time. She looked up, and saw the water had a strange bright glow. Her face passed through the water and into the air! Showing a bright new world she took in with her eyes. And almost caused a hurricane right then and there! Blushing because she didn’t know she could hold her breath that long! So away she flew, craving for more. She was met with all sorts of new sights, smells, and sounds. Her infinite mind processing each and every one. She could see it all, yet she was still an Earth foreigner. There was still so much about Earth she still needed to learn. What are the people who live here about? What is their culture, their ins and their outs? Scarf-Chan teleported right to him, without a delay. She found herself speaking English, just by a wish. Would instantly translate to the correct sounds! “Hello mister!” Scarf-Chan shouted, surprising the man. “Who are you? Why are you here?” he almost jumped up and ran. Visions of his memories began to flood into her mind. All passed through her fingers in one powerful stream. Everything he’s seen before, and nothing that he hadn’t. And knew she needed more, before she could make her own. Setting off to find more people to let her touch their face. And she wouldn’t stop until she thought she got too much. Which shampoo they put in their hair. To share their stories and grow her mind! It was so much fun to have all the open space and fresh air. With her super powerful means, she teleported to find two boys arguing. She asked them to be calm, but they didn’t listen, saying mean things to one another. The boys stopped for a second, but went back to fighting immediately. With race tracks, monkey bars, and jungle gyms. And superpowers of their own, which Scarf-Chan already possessed. Excited and boosted with confidence, the boys started to race their cars. Driving and flying, they even went swirling around the moon and the shining stars. Soon they were both laughing and screaming, enjoying all of the fun. They had already forgotten, where the problem had begun. Scarf-chan was so delighted and her eyes blossomed with pure gladness. They even gave her a big bright sunflower. Just like the sun and the flower, that values the importance of one another. Scarf-chan was so proud she sang and danced, through the pouring rain. Scarf-Chan heard the cries of an animal a few miles away, not in pain but feeling down. Looping and zipping through the sky, the clouds, the sunny weather. Finding a fox whose thoughts were cold and dark. “What’s the matter, mister fox?” She asked, speaking his native tongue. “I’ve tried and tried, but I can’t reach”, pointing to where a bunch of grapes were hung. “Those grapes up there?” Scarf-Chan replied. Focused in perfect detail like a telescope. As hot lasers shot from her eyes, destroying everything in her line of sight. His dreams were crushed before his eyes. You don’t need to be a goddess to see the obvious. Wondering if he would ever taste the purple fruit again. “It’s okay” Said Scarf-Chan, trying to calm him down. “Why is that?” The fox said, sobbing with a frown. Where the pile of ashes laid. Bright and purple, fresh and ripe. Surpassing its normal size, 3, 5, 10 times. It would take a village to eat them all! And watched as he too, began to grow in size. A big smile ran across his face. Feeling like a superhero who had saved the day. And looked forward to tomorrow to see what was in store! Suddenly Scarf-Chan hears a voice from the blue. Inside her head, cried the voice that she felt. Age, name, location, and a live view of where he was at the time. Halfway across the Earth, seemingly without a care. “What’s wrong?” Said Scarf-Chan, seeing the boy crying. I’d like to believe, but I can’t until I know. “What if she exists, but only on Mars? How do I know I haven’t seen her thus far? Is she black, white, blue, or red? “Does she speak English too? What if she speaks Chinese, or Zulu? “Not to fear, Scarf-Chan is here! I’ll find a way to save the day! Absolutely perfect for this guy. “I’ve got your girl!” Scarf-Chan yelled in delight. On their way to find the girl, across the ocean blue. They arrived in just a minute, and sat her door. He had never in his years see someone so cute before! Now he knew that when he prayed, all of his prayers would be heard. Maria looked no different, but something changed, he just knew. Giving him a big hug, her face was full of joy. Worried her soulmate was out there, but she wouldn’t know who. “What was that all about?” Maria said in perfect English, much to the boy’s surprise. He had no idea she could do that, and his eyes were opened wide. But when it left her mouth it was translated, directly into his brain! In every future vision inside Scarf-Chan’s mind. More than they do for each other. A man locked inside, crying all day. And sat next to him on his chair. As she cast a spell that made him instantly calm down. I just can’t seem to think of anything to put on the page! Why wouldn’t you make something from the ideas you’ve accrued? Said the man, whose outlook was bleak. “I looked into your mind, and saw all the paintings you haven’t made. Scarf-Chan said, eager to help the poor man out. Which she grabbed and placed in his head tenderly. Passing through his body and into the brain of the host. As the block that blocked his brain was kicked. Of all the things he never thought about. Even ideas of which he was totally unaware. “What? How? This is amazing!” The man gasped. “Did that help?” Scarf-Chan asked. “Yes, you’ve saved my life! This is the best day ever! Why not share it with the rest? Scarf-Chan knew everyone, in not-too-long. 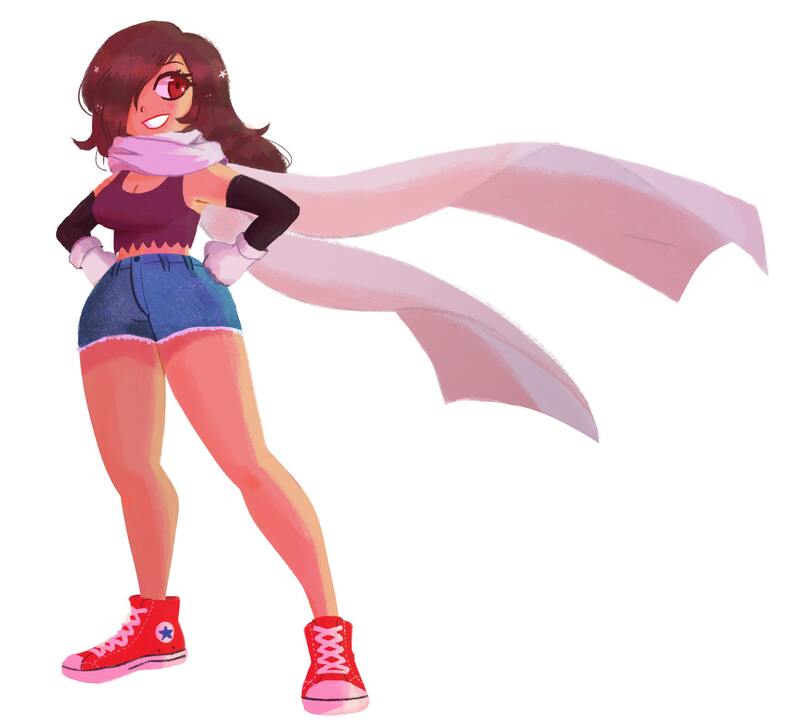 Were all based on Scarf-Chan coming along. Finds time to rest on the sun, eating a gigantic ice cream too. Despite sitting inside the fiery sun, brightly burning. And hurriedly teleported to where the commotion occurred. The walls were crumbling and the ceilings about to fall. Because they were trapped and they couldn't do anything. They know in that instance she could save all of those people locked inside. Not wasting her time with the speed of light and her powerful stroke. Unhurt and undamaged, she immediately took the people down to the safety. Everyone hugged her for they were all very pleased. She felt something else, so she looked back into the blaze. But the wooden beams caught him and held him stuck inside. Because the people still held her and they too might get harmed. And astonishingly she reverses those few minutes where the firefighter stands. He thanks Scarf-chan but sadly realizes he is now bald. Some people didn't recognize him, and some others couldn’t help but laugh. With a snap of her fingers, something beautiful appeared. Everybody got excited, and again they all cheered! He looked much younger, and very handsome too. He even thanked the fire for the old hair that it took. Laughing and dancing, the people were so merry. And they carried our dear Scarf-chan even down to the valley. Once again, our hero had made a fantastic rescue. She can fly faster than light and avoid any traffic sign. And she can do it very gracefully, with her movements so refined. when two conflicting nations were fighting, truly a big dilemma. No one was listening or giving in to any kind of supplication. But Scarf-Chan only wanted to end the fighting and tears. Exploding into a foxhole, making the soldiers scream and yell. The trees burning! The animals running! The forest they were ruining! Dying people all around, some of them were frightened and couldn’t stop crying. A big, grey ship was shooting powerful projectiles devised for demolition. But another ship countered-attacked with a weapon of similar conception. In the air, in the land and under the sea, there was only horrible devastation. “Oh no!” Scarf-chan yelled, and asked them to stop because everything had turned to ash. The woods were no longer green, and the birds were already gone, there was nothing else left but trash. Fortunately, she couldn’t be hurt, so she didn’t even received a single scratch. Saying the other one should be the first to stop their madness. The horrible situation got worse and made peace much harder. But finally, Scarf-chan thought of the most perfect answer. She distracted them by flying here, there and everywhere! They couldn’t catch her, although they were surprised to see what had transpired. It was incredibly beautiful! It was something they all desired. Scarf-chan brought back the beauty of the forest and its entire splendor. It was indeed leagues superior than it was ever before. There were bright, beautiful flowers scattered on the floor. The trees were tall, and their leaves gently swayed producing a singing choir. The bears, the lions, and all the monkeys returned. All the butterflies and birds were there, and nothing was lost. Which made them live together as happy families. Once again Scarf-chan had successfully restored happiness. They all thanked her and promised they would always solve problems with kindness. She had done something wonderful, turning enemies into friends before nine! Out of nowhere was a bright light in the sky. Appeared in the air and floated down to Earth. Who pulled out a laser and started firing at Scarf-Chan! But it didn’t stop him from firing again. “We are the ones who made you, but we made you too strong! “I don’t understand, I’m using my powers for good! This was making her furious, and she wouldn’t take it anymore. And the whole universe came to a halt. From right in front of her to the darkest corners of space. And rocketing them back into space with a mere flick. Reversing time back a few minutes before everything turned horrible. She had prevented the war and saved everyone! The powers of a goddess but only wanted to use them to play. And couldn’t be hostile if she tried. Glad that they would never have to worry again. Feeling like a goddess, she smiled. Staring at it with infinite appreciation. The earth had captured her love and affection. Every green and every blue, every red and every yellow. She learned to love her new home and strived to make it better for tomorrow. She loved looking at the Earth, most especially all of its people. Even through the hearts and the minds of every person. Scarf-chan was so invincible, she could do anything, she was unstoppable. With her new supreme intelligence, she was now very powerful! She could read minds and know if they were good or just deceitful. She could feel the sadness and all of the people's sufferings. She wanted to end all bad things and everyone’s wrongdoings. She saw people in frustration, and that turned them to aggression. "How could this be?" She said to herself. "Could I help them all, just by myself?" Beat all kinds of perils and Earth's enemy. She could still hear a lot of agony. She acted fast, without any procrastination. "This will make Earth free from catastrophe." She whispered to herself, out of her superior empathy! And there came a wonderful Scarf-chan in each and every family. A Scarf-chan that was everywhere that you glanced. For a Scarf-chan would stop any reason to cry. A Scarf-chan that cares, and will brighten their lives. not unlike Scarf-Chan’s smiling face. After her help, they had all changed their minds. And planets from afar heard of its progress. Hence, they all agreed to act benevolent and progress forth. So this ends her adventure, thanks to all of you!